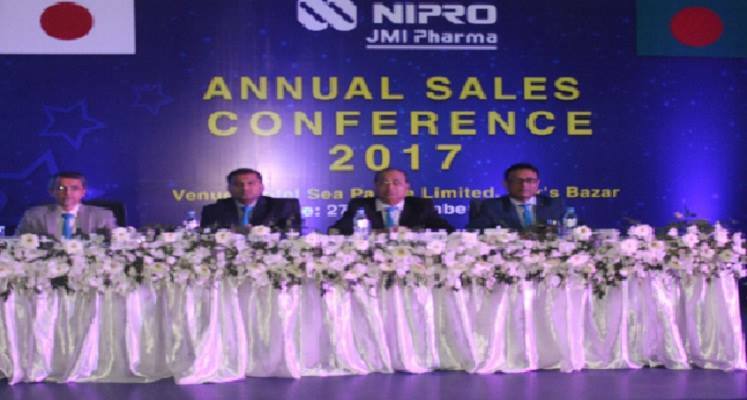 The annual sales conference of NIPRO JMI Pharma Ltd (NJP), a Japan Bangladesh Company, was held on Wednesday in Cox’s Bazar, the city of longest sea beach of the World. Md. Abdur Razzaq, the founder Managing Director of JMI Group and NIPRO JMI Pharma, inaugurated the event and expressed his dream to see a small Bangladesh in every country of the world. Chairman of the company, Jabed Iqbal Pathan revealed that quality products and skilled people are the secrets of the success. Md. Mizanur Rahman, CEO of the company, expressed to overcome the limitations of conventional treatment approach by introducing new molecules and latest technologies in the market. He also thanked all employees for their contribution to establish NJP as fastest growing Pharmaceutical company in Bangladesh. Presence of other directors, foreign delegates and managers along with around 1200 sales personnel from different regions of the country made the conference a success.